Anatomy in Motion – a new and innovative way to approach pain and injury that is leading the way in the future of manual medicine. Why is this treatment important to know about? Modern manual therapy is slowly coming to except that movement is truly the best medicine. The most profound postural changes happen in your body when you make the changes yourself, all you need is someone signposting you in the right direction. This method of treatment is for people who really want to change the way their body is working. It requires a certain degree of commitment to the work that you need to do. Through AiM sessions you will learn how your body is standing and walking and what restrictions in movement are potentially maintaining painful patterns. You will then be given the tools to help your body re-learn how to move most easily. So, what is Anatomy in Motion (AiM)? AiM is a completely new way of looking at the relationship between pain and the way your body moves. The system has been developed by Gary Ward and expert in human movement and anatomy, and author of What the Foot? Last year he was featured on BBC’s Dr in the House for helping a man rid himself of pain he had been carrying for more than 20 years. Gary’s philosophy, as with many other manual therapies, is that the body has the ability to fix itself. Unfortunately for the most part patients are rarely told how. Within the AiM system therapists don’t try and ‘fix’ you, instead they fully assess where your body has become stuck and what is stopping you reach your full movement potential. From there they simply point you in the right direction and let you and your body do the rest. Through movement based therapy you will learn how to get yourself away from pain. AiM taps into the way you move, your posture and the pain you might be experiencing. For AiM practitioners these elements are usually linked. Throughout your life your body makes adaptations for all kinds of reasons such as injury, working posture, the bag you carry, having children and many more. Often these compensations arise from a threat response. If something is causing your body pain or discomfort your body will subconsciously do everything it can to avoid it. This includes changing the way you move. Doing these new movements everyday quickly become a habit. And over time habits become your new ‘perceived normal’. However, although this new habit might be avoiding one threat it could in turn create other vulnerable areas more susceptible to injury and fatigue. A large part of your adaptation will be in your feet. These two things on the end of your feet are the first and for some the only point of contact with the ground, the things that all of your weight is supported by everyday. To avoid pain you usually have to change the way you carry your body and this almost always effects how your feet function. Creating the habits in your feet mean that once its there you will move that way until you either fix it or it changes because of another adaptation. By teaching the feet how to take care of your mass properly we can set up how the rest of your body works on top of them. Pain is often just an overworking structure trying to get your attention. You might want to be treated where it hurts but most of the time you are just chasing the pain. AiM is interested in the original cause. Sometimes this can be done quickly other times it can take a while to figure out. But to find out where it is we have to assess the whole of you. Ultimately the AiM system is always attempting to bring your body back to a neutral balanced place. When the body is balanced discomfort usually starts to fade away. We do this by re-educating your body to move freely again using the full range of movements available to you without fear of pain. Assessments are done by taking a full case history where I want to know about all of your past injuries even if they seem irrelevant – don’t forget each injury has compromised you in some way! 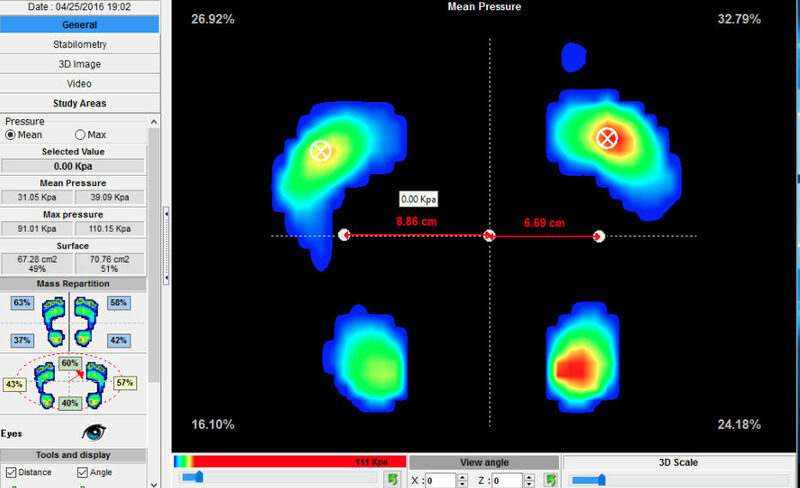 Then I use the latest digital and analogue foot analysis techniques (AmCube Footwork pressure plate) to assess how you are standing, what your feet are doing when you stand and walk and whether you carry your mass centrally or not. Then I will video how you walk in order to assess your gait and to understand what your body does to move you through space. After this we will use other biomechanical and structural techniques to assess on a more localised level the position of individual structures. Treatment will largely consist of learning movement patterns that re-teach your body how to move fluidly and without compromise when walking. You should be expecting to work in the session to achieve best results. All movement patterns are supported by video links so that they can be recapped from home without having to remember every last detail by yourself. If deemed necessary the movement patterns will be accompanied by manual techniques such as massage and articulation of joints. Although this is not always necessary. Anatomy in Motion is a new and innovative way to approach pain and injury and is leading the way in the future of manual medicine. How long is an AiM treatment with Leon? Full Diagnostic assessment and treatment starts with a 90 minute appointment. Follow up appointments last 45 mins movement patterns will be reviewed and some assessment will be done before new work set. There is also a diagnostic session available lasting 30 mins. No manual treatment will be given although a report of findings and access to a video of movement patterns deemed appropriate will be given. AiM is for people in pain who want to take control of their own their own path to recovery. It is for people who really want to change the way their body is working.